Hello, my lovelies! As I announced yesterday, my YA contemporary romance, IT FALLS APART, is making its pre-release debut on an app called Radish THIS EVENING at 7PM. So, what is Radish and how can you find my book on there? If you’re interested in reading more about the app, Medium did an article on it last year, which you can find here. So, that’s Radish 101 for you. Now let’s talk about IT FALLS APART on Radish specifically. I’ve been using the app myself for a while now and it’s fairly intuitive. You can search for my book by author name (Kate Pawson Studer) or by title (It Falls Apart). Once the book comes up, you can add it to your personal reading library by tapping on the + in the upper right-hand corner. Beside the + there are also some options for sharing the story on social media, which I would appreciate immensely. When you scroll down, you can check out individual chapters by clicking on them. IT FALLS APART will appear on Radish as a Freemium, Frontlist Pre-release. "Freemium" means that initially, you’ll be able to read the first few "episodes" of IT FALLS APART for free (the free in freemium) and then the remainder of the book will be released episode-by-episode, three times a week (Monday, Wednesday, and Saturday at 7PM). When a new chapter comes out, the app will notify you (assuming you've got my book added to your library) and readers then have the option to pay to unlock it right away or wait a week until it's released for free. It’s very flexible that way, and should you choose to pay, the end cost is on par with most e-books, so each chapter is reasonably priced. After you’ve finished a chapter, whether you paid to access it early or waited to read it for free, you’ll notice a big heart at the bottom of the text. If you enjoyed what you read (and I hope you do!) you can click on this heart to let the Radish community know you think it’s a book worth reading. Those are the basics. 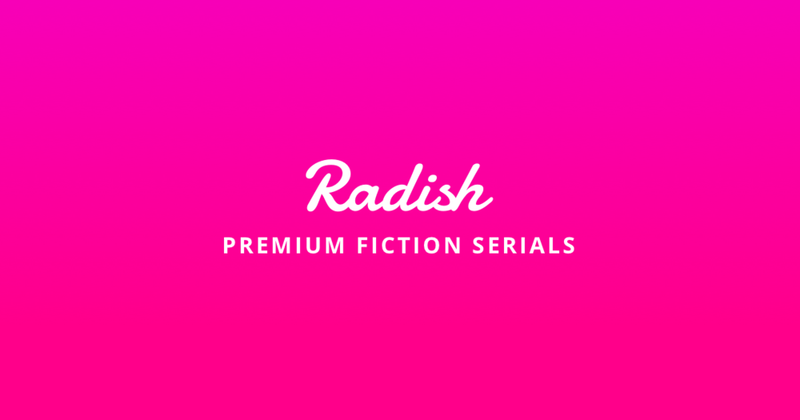 If enough people check out IT FALLS APART on Radish, we might even able to get it trending on the app’s home screen, which would bring more visibility to the story and make me a very happy author. As I mentioned in my previous post, IT FALLS APART will also be coming to Amazon/Kindle in June as a full, pay-one-price upfront e-book that you can read easily on your Kindle, computer, or other handheld devices via the Kindle app. That’s why the release on Radish is called a Frontlist (it’s new) Pre-release (it’s exclusive to Radish before it comes out on Kindle). More details about that release are coming and if you want to make sure you don’t miss out, please take a moment to pop your name and email into the subscriber box in the sidebar of this site to sign up for my (I promise it won’t be too frequent or spammy) email news updates and/or follow me on Twitter and Facebook. If you have any questions about Radish or how you can read IT FALLS APART, please feel free to comment on this post or send me a message on social media or via the contact form on this site. Thank you again for all your love, encouragement, and support. This is an exciting day! The first seven episodes of IT FALLS APART will be hitting Radish this evening at 7PM! I believe the app adjusts for time zones so that should be local time for you, wherever you are. Please check it out!